“Coney Island” is one of a series of "ritmish resitatsye" ("rhythmic recitation") poems written by Victor Packer and performed by him live on New York radio station WLTH in the late 1930s. From surviving broadcast disks housed at the Henry Sapoznik Yiddish Radio Archives at the American Folklife Center of the Library of Congress. 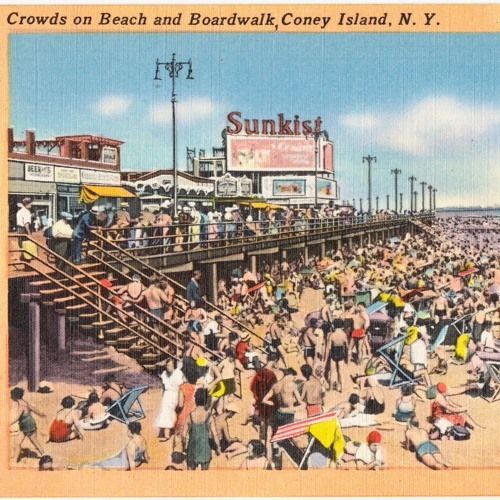 Image of "Crowds on Beach and Boardwalk, Coney Island, N. Y." postcard from the Tichnor Brothers Collection at the Boston Public Library, ca. 1930-1945, created by the Acacia Card Company, 258 Broadway, New York. Users who like Victor Packer performing his radio poem, "Coney Island"
Users who reposted Victor Packer performing his radio poem, "Coney Island"
Playlists containing Victor Packer performing his radio poem, "Coney Island"
More tracks like Victor Packer performing his radio poem, "Coney Island"